Raising children is a noble profession. In many ways, our future depends upon it. Somewhere along the way, our culture has lost sight of just how important motherhood and fatherhood really are. I looked on child rearing not only as a work of love and duty but as a profession, that was fully interesting and challenging as any honourable profession in the world, and one that demanded the best that I could bring to it. We believe that God's plans for our lives are greater than the biggest dream we can imagine, but when it comes to dreaming—it breaks our heart to know that little girls are rarely encouraged to dream of being a wife and mother. 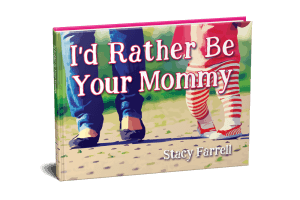 That is one reason why we were inspired to publish I'd Rather Be Your Mommy! Do you know a expectant mother or mother with little ones who needs to hear this message? Subscribe and get a 15% OFF coupon for the hardcover gift edition and a 30% OFF coupon for the digital copy of I'd Rather Be Your Mommy!